Accessories: Accompanied by Jaeger-LeCoultre service certificate dated January 27, 1999, original rubber strap, polishing cloth and document holder. Furthermore delivered with Jaeger-LeCoultre Extract from the Archives confirming production of the present watch in 1970. Introduced in 1950, the Memovox soon became one of the most desirable and reliable alarm wristwatches on the market thanks also to its ease of operation: the central disc allows to set the alarm time easily and swiftly. Soon, given the growing popularity of recreative scuba diving, Jaeger-LeCoultre’s launched an oversized, automatic waterproof diver's version of the Memovox: the Polaris. Their goal was to offer both visual (inner bezel) and auditory (alarm) timers for ultimate diver safety. To do so, the firm created a patented caseback which optimized the alarm’s sound transmission under water. The outer case, with its 16 holes, allowed for the alarm tone to be heard and also felt on the wrist, while the inner case sealed and protected the movement. The watch featured three crowns, each with the cross hatch pattern characteristic of Super Compressor watches: the first for time setting, the second to rotate the inner bezel for dive timing, and the third to rotate the inner disc with arrow to set the alarm. 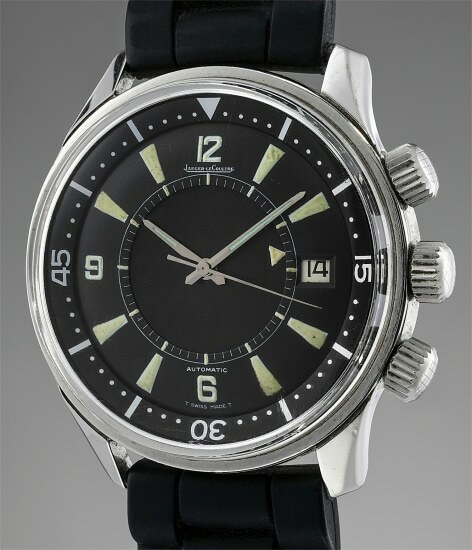 Known in the United States as the Polaris, and in the European market as the "Skin Diver Memovox", the reference E859 was made in 1714 total examples. Considering the intensive use such timepieces were subjected to, it is safe to say that only a meager part of the production survived to this day in original condition making the present piece as rare as it is aesthetically pleasing and technically interesting.